Definition at line 42 of file llframestatview.h. Definition at line 45 of file llframestatview.h. Definition at line 49 of file llframestatview.cpp. References FALSE, mCenterOn, mLabelSpacing, mNumStats, mShowPercent, mTickSpacing, mTotalTime, LLView::setVisible(), and TRUE. Definition at line 62 of file llframestatview.cpp. Definition at line 382 of file llframestatview.cpp. References llendl, llwarns, MAX_STATS, mColors, mLabels, mNumStats, and mStats. Definition at line 106 of file llframestatview.cpp. References bottom, LLView::draw(), end, f, FALSE, LLStat::getBinTime(), LLStat::getCurBin(), LLRectBase< Type >::getHeight(), LLFontGL::getLineHeight(), LLStat::getNumBins(), LLStat::getNumValues(), LLStat::getPrevBeginTime(), LLStat::getPrevTime(), LLFontGL::getWidth(), LLRectBase< Type >::getWidth(), gl_rect_2d(), i, j, LLFontGL::LEFT, left, llfloor(), llmax(), llmin(), MAX_STATS, mCenterOn, mColors, mLabels, mLabelSpacing, mNumStats, LLView::mRect, mShowPercent, mStats, mTickSpacing, mTotalTime, LLFontGL::renderUTF8(), right, S32, LLFontGL::sMonospace, LLFontGL::TOP, top, and TRUE. Definition at line 72 of file llframestatview.cpp. Definition at line 67 of file llframestatview.cpp. Definition at line 100 of file llframestatview.cpp. Definition at line 88 of file llframestatview.cpp. Definition at line 94 of file llframestatview.cpp. Definition at line 77 of file llframestatview.cpp. References addStat(), LLFrameStats::getStat(), LLFrameStats::getStatColor(), LLFrameStats::getStatLabel(), gFrameStats, i, LLFrameStats::NUM_STATS, and S32. Definition at line 65 of file llframestatview.h. Referenced by draw(), and LLFrameStatView(). Definition at line 70 of file llframestatview.h. Referenced by addStat(), and draw(). Definition at line 71 of file llframestatview.h. Definition at line 64 of file llframestatview.h. Definition at line 72 of file llframestatview.h. 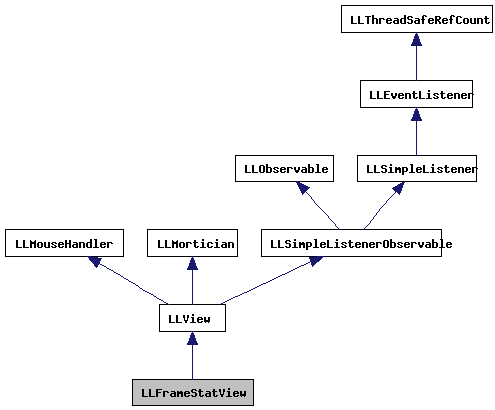 Referenced by addStat(), draw(), and LLFrameStatView(). Definition at line 66 of file llframestatview.h. Referenced by draw(), handleMouseDown(), init_stat_view(), and LLFrameStatView(). Definition at line 69 of file llframestatview.h. Definition at line 63 of file llframestatview.h. Definition at line 62 of file llframestatview.h.